ofColor represents a color in openFrameworks. Colors are usually defined by specifying a red, green, blue and optionally an alpha value (r,g,b,[a]), or a hue, saturation, brightness and optionally an alpha value (h,s,b,[a]) or hexadecimal value with an optional alpha value (0x__, a). ofColor also enables a lot of extra functionality like using HSB instead of color spectrums, lerping or linearly interpolating between colors, and inverting colors, among other things. ofColor is templated, which means that it has several different ways it can be created. These are probably best to leave as they are because there's already a few kinds typedefed for you. The default ofColor uses unsigned char values (0 to 255), but you can make an ofFloatColor if you want to work with floating point numbers between 0 and 1, or ofShortColor if you want to work with integers between 0 and 65,535. In other words, saturation refers to the intensity of the color: high saturation means intense color, low saturation means washed out or black and white. Brightness refers to how light or dark the color is: high brightness means a bright color, low brightness means a dark color. If the brightness is 0 the resulting color will be black, regardless of the values of hue or saturation. \tparam PixelType The data type used to represent a single pixel value. ofColor represents a color in openFrameworks. The default ofColor uses unsigned char values [0,255], but use ofFloatColor for floating point values [0.0,1.0], or ofShortColor for unsigned short ints [0,[65,535]]. ofColor can be represented by an RGB value, an HSB value or a hex value. Creates a color and sets it to white. ofSetColor(c); // Draw color is now white. Construct a default white color. Creates a color by copying another color, overriding the existing alpha value with the given alpha value. Construct an ofColor_ from an existing ofColor_. color The ofColor_ to copy. alpha The new alpha value to replace the alpha value in color. ofColor colorB(colorA); // colorB is now equal to colorA. Warning: Depending on the PixelType and SrcType used, color precision may be lost when converting a higher precision to a lower precision representation. Creates a gray color from a single value to describe a grayscale color. This single value will be taken by each of the R, G and B components. Alpha value defaults to completely opaque. ofColor c(0.5); // c is now gray. Construct a grayscale ofColor_ by specifying a single number. alpha The opacity of the color. ofColor c1(255, 0, 0); // Red with 100% alpha. ofColor c2(255, 0, 0, 128); // Red with 50% alpha. Construct an ofColor_ by using channel values. This clamps the values of your color in case they're too high or low for their types, in case you go negative or too use values that are too high, like anything < 0 or >1.0 in the case of ofFloatColor. c.g = 2; // g now has 2: this is usually invalid! c.clamp(); // c.g has now been clamped so its value is 1. Also for ofColor anything <0 or >255. // r component is above the limit() of 255.
c.clamp(); // c.r has now been clamped so its value is 255. Clamp values between 0 and the limit(). Clamps the value of each component, R, G, B and A to a maximum of limit() and a minimum of zero. Convenience method to construct an ofColor from a 24 bit hex value. In some cases, it is convenient to represent colors using a hexadecimal number. In this case, red, green, and blue values are packed into a single integer. The alpha channel is specified separately and will default to the PixelType's maximum, resulting in an opaque color. ofColor c = ofColor::fromHex(0xFFFF00); // c is yellow. Create an ofColor_ from a hexadecimal value. hexColor A color in hexadecimal form. alpha The alpha value of the color. Convenience method to construct an ofColor from Hsb values. While ofColor_ represents color using R, G, B, and A components, other representations are available. This method allows the user to construct an ofColor_ from a Hue (H), Saturation (S), and Brightness (B) and an optional alpha value. // c is bright saturated cyan. Create an ofColor_ from an HSB representation. hue The hue of the color. saturation The saturation of the color. brightness The brightness of the color. Return the brightness component of the HSB representation of this color. Refer the discussion of HSB above. 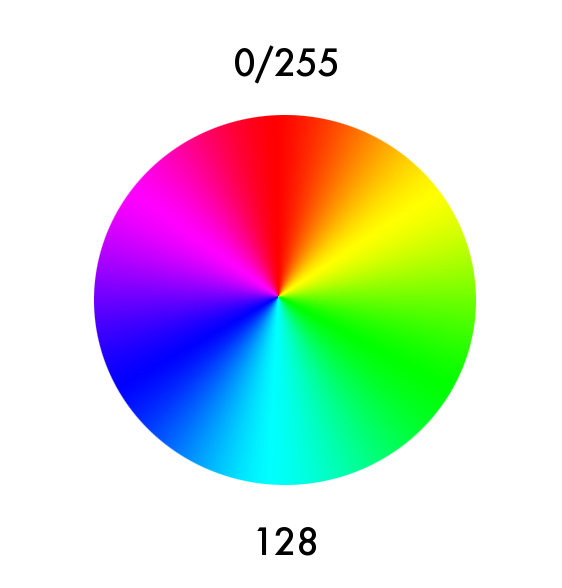 Brightness is simply the maximum of the three color components. This method of calculating brightness is used by Photoshop (HSB) and Processing (HSB). Note that brightness is also called "Value". Calculate the brightness of of the R, G and B components. Returns: the brightness in the range 0 - limit(). Returns a clamped version of this color, without modifying the original. See clamp for more info. ofColor g = c.getClamped(); // c.r is still 300. A non-destructive version of clamp(). Returns: A copy of this color, clamped. Return a 24 bit hexidecimal number representing this color. Usually when we look at these colors in print they're hex, so don't be surprised if they don't look familiar when you print them as decimal. Get a 24-bit hexadecimal representation of the RGB color. Warning: This method does not encode the alpha component. Returns: An integer representing an RGB color. Return all three components of the HSB representation of this color at the same time. float hue = 0;  // The hue value to set. float saturation = 0; // The saturation value to set. float brightness = 0; // The brightness value to set. // Hue is now 0 (for red), saturation is 255, brightness is 255. Refer the discussion of HSB above. Extract the hue, saturation and brightness (HSB) from this color. hue A reference to the hue to fill. Will be in the range of 0 - limit(). saturation A reference to the saturation to fill. Will be in the range of 0 - limit(). brightness A reference to the brightness to fill. Will be in the range of 0 - limit(). Return the hue component of the HSB representation of this color. Refer the discussion of HSB above. The color is converted from the default RGB to an HSB color space and the resulting hue value is returned. The resulting hue value will always be returned in the range 0 - limit(). Get the Hue of this color. Returns: The Hue value in the range 0 - limit(). The color is converted from the default RGB to an HSB color space and the resulting hue angle is returned. The resulting hue value will always be returned in degrees in the range 0 - 360. Get the Hue angle of this color. Returns: The Hue angle in the range 0 - 360. Returns the color that is the inverted version (complement) to this color, without modifying the original. See invert for more info. A non-destructive version of invert(). Returns: A copy of this color, inverted. Returns this color lerped towards target by amount, without modifying the original. See lerp for more info. A non-destructive version of lerp(). target The target color corresponding to an amount of 1.0.
amount The amount (between 0.0 and 1.0) to interpolate. A value of 0.0 will yield an unchanged color. A value of 1.0 will yield the target color. Returns: A copy of this color, lerped. Return a float that is the average of the three color components. This is used by the Lab and HSL color spaces. Calculate the lightness of the R, G and B components. Lightness is simply the average of the three color components. 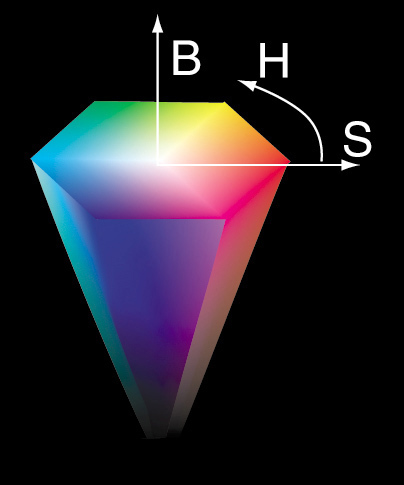 This method of calculating lightness is used by the Lab and HSL color spaces. Returns: the lightness in the range 0 - limit(). Return the saturation component of the HSB representation of this color. The resulting saturation value will always be returned in the range 0 - limit(). Refer the discussion of HSB above. Get the Saturation of this color. The color is converted from the default RGB to an HSB color space and the resulting saturation is returned. The resulting saturation value will always be returned in the range 0 - limit(). Returns: The saturation in the range 0 - limit(). ofColor c(0, 0, 255); // Blue. // c is now (255,255,0), or yellow, which is blue's complement. Invert the R, G and B components. Performs an inversion operation on the color by replacing the red, green and blue components with their original value subtracted from the limit(). The lerp method performs a linear interpolation (or lerp) between this color and a target color. In contrast to many of the mathematical functions found in ofColor_, The linear interpolation is carried out on all components, R, G, B and A. The amount is typically a value between 0.0 and 1.0, with 0.0 yielding an unchanged color and 1.0 yielding a color identical to the target color. b.lerp(r, 0.5); // now purple! A linear interpolation between all components of two colors. The linear interpolation is carried out on all components, R, G, B and A. Based on the type of PixelType (whether its a ofColor, ofFloatColor or ofShortColor), the maximum value different. For a ofFloatColor the maximum is 1.0, but for a ofColor it's 255, and for ofShortColor returns 65,536. Use this function to get this maximum number. Get the maximum value of a color component. Returns: The value associated with a fully saturated color component. Returns true iff any of the R, G, B or A components are not equal. Test two colors for inequality. Returns: true iff any of the R, G, B or A components are not equal. Creates a new color by taking two colors and multiplying and clamping their R, G and B components. The alpha component is ignored. Multiply two colors by multiplying and clamping their R, G and B components. Warning: The alpha component is ignored. color The color to multiply. Returns: The new clamped color. Multiplys R, G and B components by a scaler and clamps each to be > 0 and < limit(). Multiply the R, G and B components by a scaler and clamp each. value The value to multiply. Set a color to the cumulative product of that color and another color's R, G and B components, then clamps each to be > 0 and < limit(). Returns: A reference to itself, the new clamped color. Set a color to the cumulative product of that color and a scaler, then clamps each to be > 0 and < limit(). Creates a color that is a sum of two color's R, G and B components, then clamps each to be > 0 and < limit(). Add two colors by summing and clamping their R, G and B components. color The color to add. Creates a color that is a sum of one color's R, G and B components and a value, then clamps each to be > 0 and < limit(). Add a value to each of the R, G and B components and clamp each. color The value to add. Set a color to the cumulative sum of that color and another color's R, G and B components, then clamps each to be > 0 and < limit(). Set a color to the cumulative sum of that color's R, G and B components and a value, then clamps each to be > 0 and < limit(). Creates a color that is the difference between two color's R, G and B components, then clamps each to be > 0 and < limit(). Subtract two colors by subtracting and clamping their R, G and B components. color The color to subtract. Creates a color that is the difference between one color's R, G and B components and a value, then clamps each to be > 0 and < limit(). Subtract a value from each of the R, G and B components and clamp each. value The value to subtract. sets a color to the difference between that color's R, G and B components and another color's R, G and B components, then clamps each to be > 0 and < limit(). Add two colors by subtracting and clamping their R, G and B components. Sets a color's R, G and B components to the difference between each component and a value, then clamps each to be > 0 and < limit(). Subtract a value to each of the R, G and B components and clamp each. color The value to subtract. Creates a new color by taking two colors and dividing and clamping their R, G and B components. The alpha component is ignored. Divide two colors by treating the passed color components as divisors. Creates a new color that is the quotient of a color's R, G and B components and a divisor value and clamps each to be > 0 and < limit(). Divide each of the R, G and B components by a scalar and clamp each. Set a color to the quotient of that color's and another color's R, G and B components, then clamps each to be > 0 and < limit(). R, G, B and A components are set to the the values of the assigned color. Assign a color using an existing color. color The color to assign. R, G and B components are set to the grayscale value and alpha is set to limit(). Assign a color using a grayscale value. Test two colors for equality. Returns: true iff the R, G, B and A components are all equal. If n is 0 returns .r, if 1 returns .g, if 2 returns .b, if 3 returns alpha. float red = c; // Red is 128.
n An index 0-3 of the component to get. Returns: The value of the requested component. Array subscript operator. If n is 0 returns .r, if 1 returns .g, if 2 returns .b, if 3 returns alpha. This will use the R, G, B and A components from the passed color. Set an ofColor_ from an existing ofColor_. Creates a gray color from the value of gray. This single value will be taken by each of the R, G and B components. The alpha value defaults to completely opaque. c.set(128, 128); // ... and now 50% gray with 50% alpha. Set a grayscale ofColor_ by specifying a single number. c.set(0, 255, 0); // ... and now green. Set an ofColor_ by using RGB values. Change the current brightness, leaving hue and saturation the same. c.setBrightness(128); // ... dark blue. Refer the discussion of HSB. Set the brightness of this color. brightness A brightness value to set in the range of 0 - limit(). In some cases, it is convenient to represent colors using a hexadecimal number. In this case, red, green and blue values are packed into a integer. Set this color to hexColor using a 24 bit hex-style color as normally used in web development. The alpha channel is specified separately and will default to the PixelType's maximum, resulting in an opaque color. c.setHex(0xFF8000, 128); // Orange, 50% alpha. Set an ofColor_ from a hexadecimal representation. Warning: The alpha value should not be packed in the hexColor and must be specified separately. hexColor An RGB color in hexadecimal form. In some cases, it is convenient to represent colors using a HSB value. In this case, red, green and blue values are represented by their hue, saturation and brightness. Set this color using a HSB representation. Refer the discussion of HSB above. 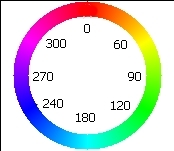 Note that the hue value has a range that matches the base data type (ie 0 to 255 for the standard ofColor), rather than 0 to 360, 0 to 100 or float 0 to 1, as may be expected. The alpha channel is specified separately and will default to the PixelType's maximum, resulting in an opaque color. Set the color using HSB components. hue A hue value to set in the range of 0 - limit(). saturation A saturation value to set in the range of 0 - limit(). alpha An alpha value to set in the range of 0 - limit(). Change the current hue, leaving saturation and brightness the same. Set the hue of this color. The hue field in setHsb() and in setHue() represents hue as a range between 0 and 255 because the hue value has a range that matches the base data type, setHueAngle() sets hue using the conventional way to represent hue: with the range between 0 and 360. Set the hue angle of this color. angle A hue angle value to set in the range of 0 - 360 degrees. Change the current saturation, leaving hue and brightness intact. c.setSaturation( 128 ); // ... pale blue. Set the saturation of this color. saturation A saturation value value in the range of 0 - limit().